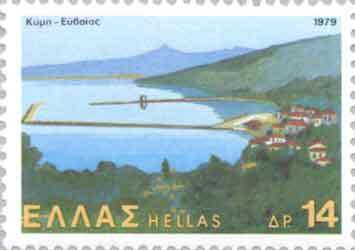 Euboea, or Evia or Negropont (Greek: Εύβοια, "She who is rich in oxen" , modern transliteration: Evvoia, Evvia or Evia), is the largest island of the Greek archipelago. It is separated from the mainland of Greece by the Euboic Sea. In general outline it is long and narrow; it is about 150 km (90 miles) long, and varies in breadth from 50 km (30 miles) to 6 km (4 mi). Its general direction is from N.W. 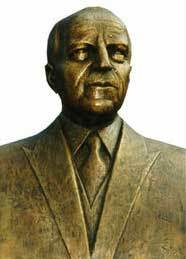 to S.E., and it is traversed throughout its length by a mountain range, which forms part of the chain that bounds Thessaly on the east, and is continued south of Euboea in the lofty islands of Andros, Tenos and Mykonos. 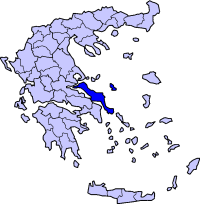 Euboea has one of the longest prefectures in Greece in length. Euboea is also the second largest island in Greece by area and population after Crete. Euboea was believed to have originally formed part of the mainland, and to have been separated from it by an earthquake. This is fairly probable, because it lies in the neighbourhood of a fault line, and both Thucydides and Strabo write that the northern part of the island had been shaken at different periods. Its northern extremity is separated from the Thessalian coast by a strait, which at one point is not more than 1.5 miles (2.4 km) wide. In the neighbourhood of Chalcis, both to the north and the south, the bays are so confined as to make plausible the story of Agamemnon's fleet having been detained there by contrary winds. At Chalcis itself, where the strait is narrowest, it is called the Euripus. The extraordinary changes of tide which take place in this passage have been a subject of note since classical times. At one moment the current runs like a river in one direction, and shortly afterwards with equal velocity in the other. A bridge was first constructed here in the twenty-first year of the Peloponnesian War (410 BC). The name Euripus was corrupted during the Middle Ages into Evripo and Egripo, and in this latter form transferred to the whole island. Later the Venetians, when they occupied the district, altered it to Negroponte, referring to the bridge which connected it with the mainland. Like most of the Greek islands, Euboea was originally known under other names, such as Macris and Doliche from its shape, and Ellopia and Abantis (Άβαντες) from the tribes inhabiting it. The main mountains include Dirphys (1,745 m), Pyxaria (1,341 m) in the northeast and Ochi (1,394). The neighboring gulfs are the Pegasitic Gulf in the north, Maliakos Gulf, Northern Euboean Gulf in the west, the Euboic Sea and the Petalion Gulf. men from the steep fortress Dium, Carystus, and Styra. to pierce armed bodies with their long ash spears. Forty black ships came with Elephenor. 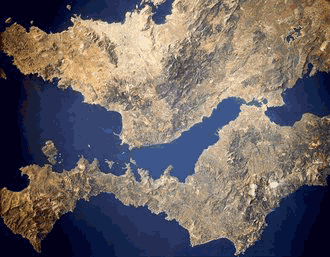 The history of the island is for the most part that of its two principal cities, Chalcis and Eretria. Both cities were Ionian settlements from Attica, and their importance in early times is shown by their numerous colonies in Magna Graecia and Sicily, such as Cumae, Rhegium and Naxos, and on the coast of Macedonia. In this way they opened new trade routes to the Greeks, and extended the field of western civilization. How great their commerce was is shown by the fact that the Euboic scale of weights and measures was in use in Athens until Solon, and among the Ionic cities generally. They were rival cities, and appear at first to have been equally powerful; one of the earliest of the sea-fights mentioned in Greek history took place between them, and in this it is said that many of the other Greek states took part. In 490 BC Eretria was utterly ruined and its inhabitants were transported to Persia. Though it was restored after the Battle of Marathon, on a site at a little distance from its original position, it never regained its former eminence, but it was still the second city in the island. From this time its neighbour Chalcis held an undisputed supremacy. Already, however, this city had suffered from the growing power of Athens. In the year 506 BC the Chalcidians were totally defeated by the Athenians, who established 4000 Attic settlers on their lands, and seem to have reduced the whole island to a condition of dependence. Again, in 446 BC, when Euboea endeavoured to throw off the yoke, it was once more reduced by Pericles, and a new body of settlers was planted at Histiaea in the north of the island, after the inhabitants of that town had been expelled. The Athenians fully recognized its importance to them, for supplying them with corn and cattle, securing their commerce, and guaranteeing them against piracy, because its proximity to the coast of Attica rendered it extremely dangerous to them when in other hands. But in 410 BC the island succeeded in regaining its independence. After this it took sides with one or other of the leading states, until, after the Battle of Chaeronea, it passed into the hands of Philip II of Macedon, and finally into those of the Romans. In modern history Euboea or Negropont comes once more prominently into notice at the time of the Fourth Crusade. In the partition of the Eastern empire by the Latins which followed that event the island was divided into three fiefs, the occupants of which found it expedient to place themselves under the protection of the Venetian republic, which henceforth became the sovereign power in the country. In 1470, after a heated defence, this well-fortified city was wrested from them by Mohammed II, and the whole island fell into the hands of the Turks. At the conclusion of the Greek War of Independence, in 1830, the island was delivered from Turkish rule, and constituted a part of the newly established Greek state. It is linked by two bridges, one that runs through Chalkida and is also access from Thiva and another one bypasses Chalkida and is accessed from Athens. All of the modern bridges are suspended. In the 1980s, the Dystos lake was filled with grass which was set on fire by farmers to make more farmland. This act caused devastation on much of the plants and the environment in that area. A company was going to build a factory there. The mining areas include magnesite in Mantoudi and Limni, lignite in Aliveri and iron and nickel from Diprhys. Marble is mined 3 km north of Eretria which include Marmor Chalcidicum and asbestos in the northeastern part of Carystus in the Okhi mountains. Greece Interstate 77 NW, N, W, Cen. There are no provinces on the island of Syros. Name of inhabitants: Euboean sing.